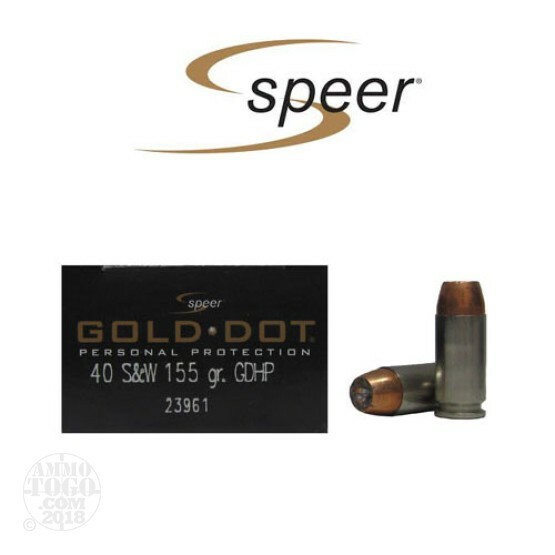 This 40 S&W cartridge from Speer’s Gold Dot ammunition line features a true bonded core 155 grain projectile. Its jacket was applied to its core one single molecule at a time via Speer’s proprietary Uni-Cor electrochemical process, so it is not only extremely uniform to promote straight flight, but further virtually inseparable so that it can exhibit ideal weight retention. A Gold Dot projectile’s hollow point nose cavity is formed via a two stage process. The first ensures that the bullet expands to the correct width for effective self-defense, while the second ensures that expansion takes place at a reliable speed. The Gold Dot bullet is finally finished with a smooth profile that promotes dependable feeding in a semi-automatic weapon. This cartridge’s factory fresh brass casing is plated with nickel. Shiny nickel not only provides the lubricity that seamless cycling demands, but is also easier to spot in the dark and furthermore resistant to tarnishing. Speer’s propellant charge creates the ideal chamber pressure for this round’s caliber, and their primer is sensitive enough to trust when your safety is on the line.